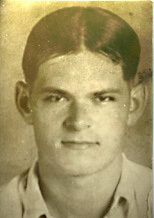 Sherman worked for L & N Railroad from 1926 to 1936. Not only did Sherman work for the railroad but his father Elijah did as well as most of his brothers. Sherman held various positions on the railroad one of them was working on the whistle! At some point during the Depression Sherman worked in the Coal Mines. Times were so tough during the Depression that people had to come up with creative means of making money. Sherman had some very creative ways to make a few spare dollars. He was good at handling his own money and generally had some reserves, so when someone needed a loan, he loaned the money at a rather high interest rate; basically loan sharking. He also had a fairly lucrative business in selling condoms that he ordered by mail in bulk and sold for profit. In those days condoms were not easily obtainable in every corner store! Following that he worked for the Post Office as Assistant Post Master in Hazard, Kentucky for about 30 years. He was also a pitcher for a local Hazard baseball league. He was serious about his baseball. One did not interrupt him while listen to or watching a baseball game, it was not even advisable to breathe until a commercial came on. During the 1950's and 60’s Sherman and some of his neighbors built and maintained a small cable television system for Orchard Street and other streets in Wabbaco; one of the first cable systems in the area. One major problem they had was that of people stealing the very expensive equipment off the poles needed to run the system. I remember seeing him watching the mountain with binoculars being ready to grab his pistol and drive up the mountain to catch the thieves. Of course by the time he got there, the thieves were gone and so was the expensive equipment. It was probably a good thing they were gone! Sherman was an avid bird watcher and fisherman. We are still not sure if there is any Native American blood in the family however Sherman had many traits of a Native American: He had the skill of walking through mud without getting mud on his dress shoes. He walked in such a way that his steps did not disturb the earth and left no evidence of his being there. He had a quiet thoughtfulness that commanded attention. One knew when to speak and when to listen. My grandfather was very wise and gave a lot of advice on many things, such as to not be wasteful and that we should always save at least 10% of everything we earn. We do not always follow his advice but we do think of him often and remember him fondly.